Review 21. 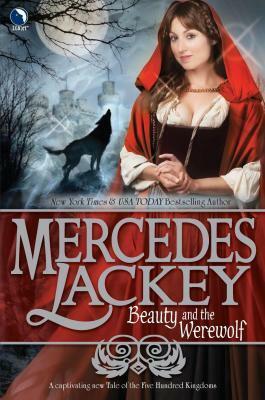 Mercedes Lackey - Beauty and the werewolf. Mercedes Lackey - Beauty and the werewolf. Serie: part six of the five hundred kingdoms, but you can read it as a stand alone. The magic continues in "New York Times"-bestselling author Lackey's enchanting new story from the Tales of the Five Hundred Kingdoms series. A beauty must battle some beasts before she rescues her prince. 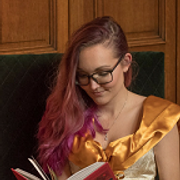 I know that this book is part of the Five hundred kingdoms series, but Beauty and the Beast is my favorite tale ever, so I had to read this one. This book definitely persuaded me to read the other books. This time we meet Isabella - Bella - who is going to the Granny of the village. When she returns home - it's already very late - she gets bitten by a wolf. And not just á wolf, a werewolf. His name is Sebastian and he's the duke. Immediately she's taken away from home and placed in the same house as Sebastian. They want to make sure that she won't become a werewolf herself. In meantime she get to know Sebastian and his very strange household. She finds out that there's much more going on than she thought and she makes big changes in Sebastians life. But is that enough? I just lóved it. I adore Bella in this story. She's witty, she knows what she want and she says what she think. She's a rebel and I truly enjoyed reading this story about her. On the other hand you have the arrogant Eric and the shy Sebastian. It was also a very original twist of the story. I haven't heard of this book before too but the cover looks really interesting! I'm also really interested with the summary! I might need to add this to my TBR! Awesome review, Mel! ♥ So glad you enjoyed it!